Holly berries are one of the most iconic of Christmas decorations, decking the halls of many a house in the festive season and now you can grow your own Holly berries too in a lovely golden variegated form. Despite it's name, 'Golden King' is actually a female form, the one's which produce the berries! 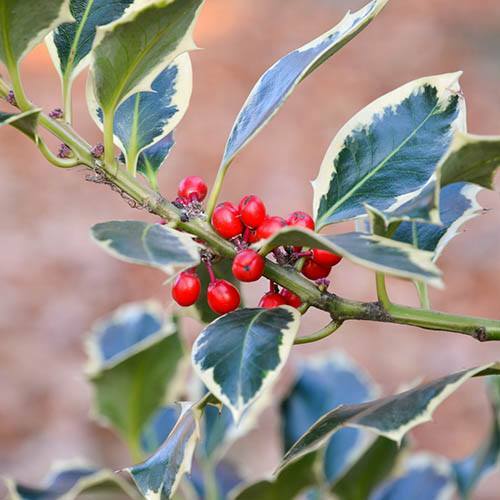 Holly is a slow-growing and easy to manage bush, for large pots or shrubberies. It is very tough, evergreen and with this lovely golden variegation offers year round colour in addition to the berries. Supplied as a bushy, well branched 3 year old plant in a 1L pot, approx. 25-30cm tall, ready to plant straight out. Holly berries are one of the most iconic of Christmas decorations, decking the halls of many a house in the festive season. Now you can grow your own Holly berries too, with a twist - a lovely golden variegated form. Despite it's name, 'Golden King' is actually a female form, the one's which produce the berries! Holly is a slow-growing and easy to maange bush, for large pots or shrubberies. It is very tough, evergreen and with this lovely golden variegation offers year round colour in addition to the berries. Supplied as a bushy, well branched 3 year old plant 25-30cm tall to plant straight out.